Use SignalFx to monitor Azure Kubernetes Service via Microsoft Azure. 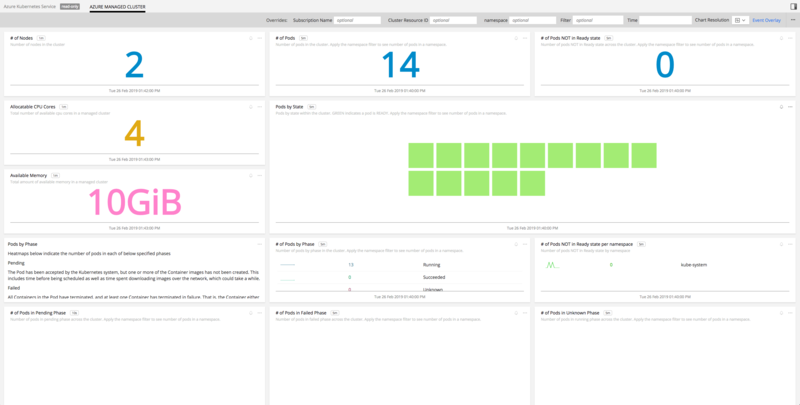 Azure Managed Cluster: Shows metrics of an Azure Managed Cluster. Number of Nodes - Number of nodes in the Azure Kubernetes Cluster. Number of Pods - Number of pods in the Azure Kubernetes Cluster. Available CPU Cores - Available CPU cores across the cluster. Available Memory - Available memory in the cluster in Bytes. Pods By State - Heatmap showing the number of pods in Ready state across the cluster. GREEN shows pods in Ready state. Pods by Phase - Number of pods in different phases across the cluster. Number of Pods NOT in Ready state per namespace - Number of pods per namespace that are not in Ready state. 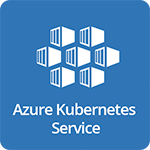 For more information about the metrics emitted by Azure Kubernetes Service, visit here.